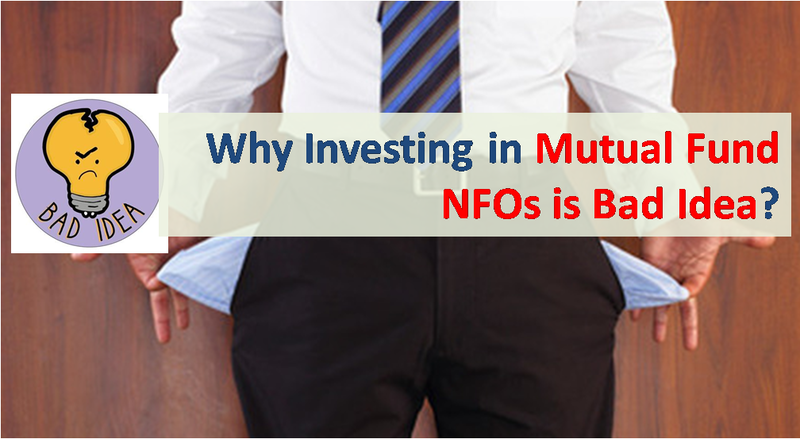 Should You Invest In Mutual Fund NFOs? With the rising stock market, there has also been deluge of equity NFOs (New Fund Offers) from Mutual Fund Companies. This phenomenon is repeated every time the stock market starts running! The graph below shows the trend of equity NFOs from 2000. As you can see most NFOs are launched when the market is nearing its peak! So there was multiple Equity based NFOs between August 2007 to June 2008. Similarly there were multiple NFOs between October 2014 to October 2015. Why Mutual Funds launch NFO at the Peak? The reason is simple, mutual fund houses find it easier to sell NFOs when the stock markets are going up. The sentiment among retail investors is up and they can easily be sold the same old product with new names and new promises! What has changed from Last NFO Obsession? There have been a major change in the NFO launch – earlier most of the NFOs used to be open ended but now more than 60% of equity NFOs (in last 6 months) are closed ended. This change can be mainly attributed to new regulations by SEBI where in a Mutual Fund house cannot launch additional scheme which follows the mandate of an existing scheme. Also with the close ended fund the distributors could be paid more commission upfront (in most cases) and hence these funds are pushed more. Closed vs Open Ended Mutual Funds? Closed ended Mutual Fund Schemes are those which can be redeemed from Mutual Fund houses only at the time of maturity. Also these funds can be bought only at the time of NFO. To provide early exit, they are listed on stock exchanges but the liquidity is so low that one cannot practically get out of these schemes. Open ended mutual funds are those schemes where you can buy/redeem your investment with mutual fund companies on all working days. There is no entry or exit from the fund, which means that the fund manager can invest the entire corpus optimally without worrying about fund inflows or outflows. In case of open ended funds fund manager has to regularly keep a part of corpus in liquid instruments to take care of redemption. This pulls down the returns. There is no pressure to perform every quarter, so the fund manager can focus on long term investment. In open ended funds there is risk of redemption in case the scheme starts under-performing even for a quarter. But unfortunately most of the time these closed ended funds give returns similar to open-ended funds. The major disadvantage of closed ended funds is that it’s linked to market timing. For e.g. if you had invested at the peak of the bull market in 2008 in an equity NFO maturing after 3 years; Your returns would definitely be negative and then you could not stay put in the fund for better days! So you have to forcefully book losses. To reduce the market timing issue the recent NFOs have only dividend payout option where they would payout dividends as the funds books profits. I don’t think it’s a good idea mainly because dividends are rarely used productively. Do you remember what you did with the last dividend you received? Probably you might not have even noticed or spent it carelessly. To create long term wealth you should always subscribe to Growth option! The next issue is of liquidity. You would not be able to redeem your fund before maturity. So the money is locked. Also Read: How are Equity and Debt Mutual Funds Taxed? Why People Invest in NFOs? Confusing NFO with IPO – there was time when people made quick money in IPOs of Stocks. Some people confuse these NFO of mutual funds with IPOs and think they can make quick money once listed! Lower NAV is better than higher NAV – there is a misconception among investors that lower NAV is better for investment. So they invest in NFOs with NAV of Rs 10 rather than existing funds with higher NAV. The fact is NAV should never be criteria to select funds. Also Read: Should you invest in Child Plan Mutual Funds? Why keep away from Most NFOs? 2. No track record – if you talk to any expert about which mutual fund to invest, the advice is based on their past performance! Though past performance may not predict the future performance but that is the best you can do! This is true for most of the choices you make – for e.g while hiring someone you always want to know what he did in the past which does not guarantee success in future roles but that’s the best you can do! In fact the longer the performance record, the better it is. It can tell you how the fund performs in different market cycles. Also does the fund sticks to its mandate? What’s the funds expense ratio? Unique Themes – There could be some themes which is non-existent today such as investing in some specific foreign markets. Even here you should invest in NFO only if the fund is closed ended. For open ended fund you can check their performance for few months/years before taking the plunge. However please note that for funds of funds investing in foreign markets you bear additional currency risk and this diversification may not be necessary for most of regular investors. Incentive while investing in NFO – There was 5% discount and 1 additional unit for every 15 units after one year for retail inventors investing at the time of NFO of Goldman CPSE ETF. So if you wanted to add PSUs to your portfolio investing in this NFO made sense. Most of the equity NFOs launched are beneficial for Mutual Fund Houses and their distributors. You should keep away from them until they offer some value to your existing portfolio. Before investing in NFO, always compare it with open-ended funds with longer track records! i think people should invest in Bank Deposit who earns annually less than 2.5L..I sure you will get more corpus than MFund. if you invest in best mutual fund it will give return 30% for 5 years and in bank 41% after 5 years. But surely and steadily you can gain more.